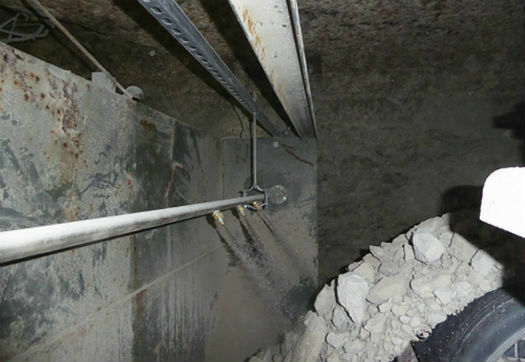 NEPONSET (US) - A global leader in conveyor technology has helped mitigate dust emissions at the underground limestone mine of a cement production plant by implementing an innovative transfer point solution. Using a specially-designed dust control unit (DCU) to spray a surfactant onto both sides of the cargo stream during transfer onto the main conveyor, Martin Engineering was able to help Continental Cement Company, LLC, suppress fugitive dust both along the underground belt path and during discharge at the outdoor storage yard. The result was a significant reduction in dust emissions, creating a safer workplace and offering a measurable return on investment. Continental Cement has been in operation since 1903. Over more than a century, the company has continued to improve and increase operations to reach a current cement production capacity of 1.2 million short tons (≈1.1 mil. tonnes) of clinker annually. A 350 foot (106 m) underground mine now provides the primary source of limestone, which makes up 75% of the raw material required to produce the meal in the company’s Type I/II, and Type III Portland cement. Yielding 1.6 million short tons (≈1.4 million tonnes) of limestone annually, the extracted material is transported via truck and high-speed conveyors in order to move it to the surface, where it is held in a 100,000 ton (≈91,000 tonne) outdoor storage pile, then processed through a four-stage preheater/precalciner dry process cement kiln. Fifty-ton trucks dump 600-650 t/h (544-589 mt/h) of extracted limestone into an underground hopper that feeds an impact crusher, which reduces the rocks to 4-in. (101 mm) minus. The aggregate is then loaded onto Conveyor 0, a 60-inch (1524 mm) wide belt traveling approximately 700 fpm (3.5 m/s) for 400 feet (122 m). The rock is discharged through a transfer chute onto Conveyor 1, travelling up the 1,300 foot (400 m) inclined belt to the surface and dropping 20 feet (6 m) onto the outdoor storage pile. With an approximate 300:1 water-to-additive ratio, the MEL-101 supports the water’s role in providing dust suppression using economically concentrated volumes. To control costs, the VFD-driven pump regulates chemical flow by releasing chemical only when material is detected on the conveyors. Nozzles were placed at the hopper mouth, so the DCU could spray treated moisture inward toward the impact zone. By keeping the particles within the material flow, the new dust control system helps minimize health and safety issues, reduce wear and tear on equipment and create a better work environment.